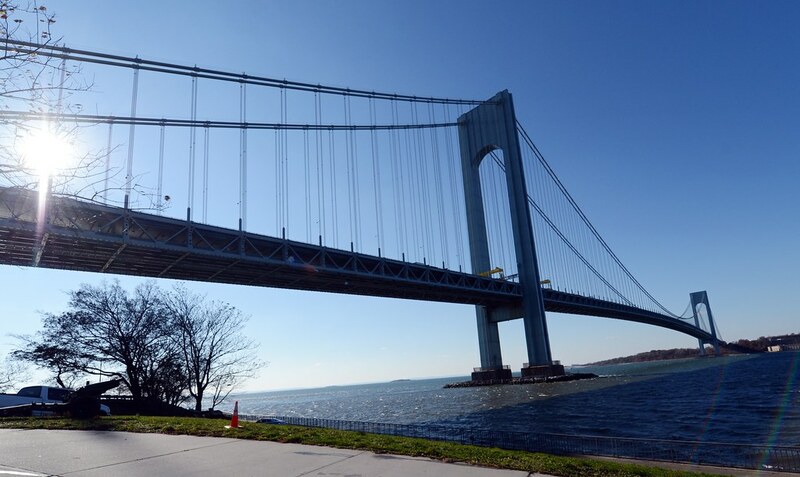 Spanning the distance between Brooklyn and Staten Island, the Verrazano-Narrows Bridge is undoubtedly one of New York’s most impressive architectural monuments. Unfortunately, most people mistake it for the more famous of the two- the Brooklyn Bridge. While it doesn’t have the same notoriety, the Verrazano-Narrows Bridge is definitely a star in its own right. The idea of a bridge was first proposed in the 1920s, in order to connect the isolated Staten Island to the rest of New York City. That initial proposal, along with dozens of others, were deferred over the next 20 years. Until 1947 when infamous urban planner Robert Moses advocated for a bridge across the Narrows. Moses had spent time studying the possibility of a tunnel but found that a bridge would be significantly cheaper. The bridge is named for both the body of water it spans and famous Italian explorer Giovanni da Verrazzano. Giovanni sailed under the service of King Francis I of France and was the first to discover New York Harbor in 1524. This tribute was first proposed in 1951 by the Italian Historical Society of America. They were eager to re-establish Verrazzano in history as his reputation was mostly forgotten. “The Narrows” refers to the entry way of New York Harbor- a very confined body of water. You may have noticed a discrepancy in the naming of the bridge as it is spelled with only one “z” while Giovanni spells his name with two. Due to a spelling error in the original construction contract, the official title was set incorrectly. There have been a number of requests since to formally change the name and add a second “z” but none have been signed into law until this past October 2018. Structural engineer Othmar H. Ammann, architect of the Golden Gate Bridge, was hired to design the plans for this new project. Various issues delayed the start. Official construction didn’t begin until August 14, 1959 with an initial budget of $78 million and a planned 6,540 foot span. A total of 10,000 workers were employed to build the bridge. Outside of Manhattan, the suspension towers are the tallest structures in New York City. Due to the towers height and distance from one another, the curvature of the Earth’s surface had to be taken into account when designing the bridge. Had the two suspension towers been parallel, the bridge would collapse, meaning each tower is almost 2 inches farther apart at their tops than at their base. Each of the towers contain approximately 1 million bolts and 3 million rivets. In total, they contain 3 times as much metal as the Empire State Building. 142,520 miles of bridge cables were strung around the bridge a total of 104,432 times. Each main suspension cable is composed of over 26,000 wires with a diameter of 36 inches. Because of thermal expansion of the steel cables, the upper roadway is actually 12 feet lower in summer than in winter. Since The Narrows is the only entry point for cruise ships and container ships that dock in New York Harbor, any ship must be built to accommodate the clearance under the bridge (around 228 ft). The final cost of construction was over $320 million. While the bridge had been scheduled to open in 1965, a faster than anticipated rate of progress allowed them a November 1964 opening. The opening ceremony was attended by over 5,000 people- politicians and dignitaries- but not a single of the over 10,000 workers were invited. In response, they boycotted the event, and instead held a ceremony in memory of the three workers who died during construction. 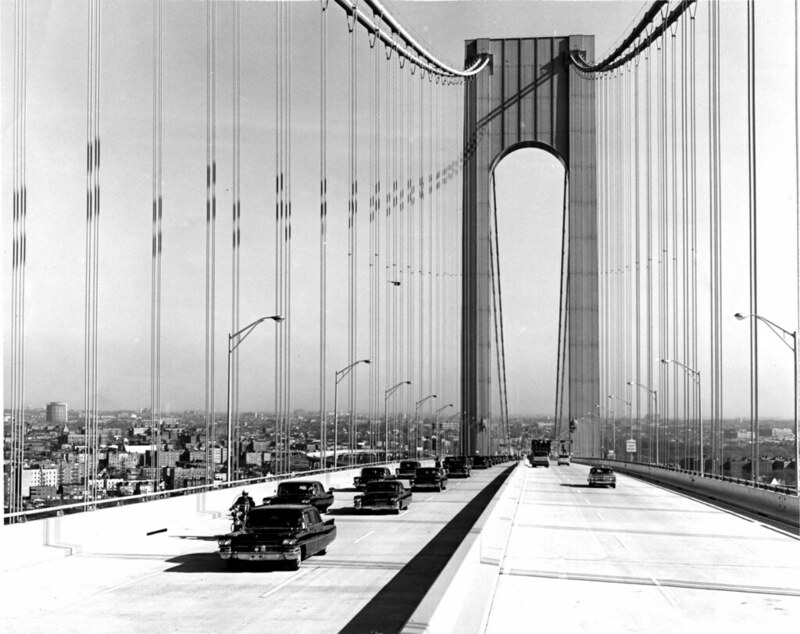 With a span of 4,260 feet, the Verrazano-Narrows Bridge was the longest suspension bridge in the entire world when it first opened. It was surpassed in 1981 by the Humber Bridge in the UK but still remains the longest in North America. While only 60 feet longer than the Golden Gate Bridge, it can hold a 75% greater load. Within two months of opening, almost 2 million vehicles utilized the new crossing- significantly more than originally projected. Due to the increasing popularity, a second six-lane roadway was erected underneath the main deck in 1969. In June of 1976, workers placed a giant American flag on the side of the bridge to celebrate the 200th Anniversary of the United States. The flag was larger than a football field and billed as the largest U.S. flag ever made at the time. Unfortunately, it ripped apart after just three days due to high winds. A second flag was created in 1980 for the same celebration that year. Although it was made even larger, workers were able to place it so it would not rip. Originally built with no pedestrian walkway or bike path, there have been various calls for both since its’ opening. At the time it was seen as too expensive and many people believed that a lack of a walkway would prevent possible jumpers. But local residents on both sides have started advocating for their construction. While it has certainly been taken into consideration, any additional plans for either are long-term and will most likely not come to pass anytime soon. In 1976, the Bridge was designated as the starting point of the New York City Marathon. That year was the first time in history that the course went outside Manhattan. It now starts at the Staten Island end of the bridge every year. Get amazing views of the Verrazano-Narrows on our Statue of Liberty and Ellis Island tour!